Summary: Ramona was only five years old when Hurricane Katrina changed her life forever. Since then, it’s been Ramona and her family against the world. Standing over six feet tall with unmistakable blue hair, Ramona is sure of three things: she likes girls, she’s fiercely devoted to her family, and she knows she’s destined for something bigger than the trailer she calls home in Eulogy, Mississippi. But juggling multiple jobs, her flaky mom, and her well-meaning but ineffectual dad forces her to be the adult of the family. Now, with her sister, Hattie, pregnant, responsibility weighs more heavily than ever. The return of her childhood friend Freddie brings a welcome distraction. Ramona’s friendship with the former competitive swimmer picks up exactly where it left off, and soon he’s talked her into joining him for laps at the pool. But as Ramona falls in love with swimming, her feelings for Freddie begin to shift too, which is the last thing she expected. With her growing affection for Freddie making her question her sexual identity, Ramona begins to wonder if perhaps she likes girls and guys or if this new attraction is just a fluke. Either way, Ramona will discover that, for her, life and love are more fluid than they seem. I've been a big fan of Julie Murphy ever since I read her book Dumplin' a few years ago. Amber and I (back when Amber used to blog!) were super excited about it at the time, and it was one of the hottest ARCs going around at that year's Book Expo and BookCon. (Thanks to our awesome blogger friend Nori for giving us her copy!) So basically, when I read about Ramona Blue, I was itching for it from the get go. And then, a few months late to the game, I managed to pick up a copy at The Strand. I was excited to start the book, and I'm glad I did, because this story was unlike any other I had read in a long time. Julie Murphy has a way of writing stories that touch you and have you hooked from start to finish. I ended up flying through this book like it was nothing because the end of every chapter made me want to turn the next page. As the summary explains, Ramona is living in a beat-up trailer with her father and her pregnant older sister, Hattie, after Hurricane Katrina took their old lives from them a few years prior. With not much money and no real home, Ramona was constantly working and struggling to make ends meet while supporting her sister and her father that gave everything he could to them. And Ramona had her own struggles as well -- it wasn't easy being a lesbian teenage girl in Mississippi, but that never made her afraid to be who she was. It did, unfortunately, make people such as her own mother doubt the validity of her sexuality. So in addition to already having to face the challenge of overcoming the forces of Mother Nature and the life that was taken from them, Ramona also has to struggle with having to prove her true self to so many people around her -- because, according to people like her mother, homosexuality is nothing but a phase. My favorite character in this book was definitely Freddie. He was always so sweet and kind to Ramona and her family, even when he didn't have to be. Even when things were tough, he was always going out of his way to make sure that he was being a good person to them. Freddie was just overall a good person. (And apparently a great, super cute chef.) The way he and his family showered Ramona what true unconditional love felt like all of the time, even when she didn't necessarily feel like she deserved it, was inspiring. And what was even better was that they met as children completely by chance. If the circumstances hadn't lined up just so all those years ago, Freddie may have never met Ramona at all. Which would have been tragic, because the two of them are totally adorable. He is such a genuinely good guy all of the time, even when he definitely had reasons not to be, and that just made me like him even more. Another character that I really enjoyed in this book was Saul. I felt like he was absolutely hysterical, always adding quips and butting into scenarios at the perfect time. If I had a gay best friend, I'd definitely want it to be Saul. He seemed like a great guy to be around, that's for sure. Any scene where he was involved had me laughing out loud and sending Snapchats of his commentary to some of my good friends, because I wanted them to be able to laugh about it too. When it comes to character creation, Julie Murphy definitely got it right with this guy. 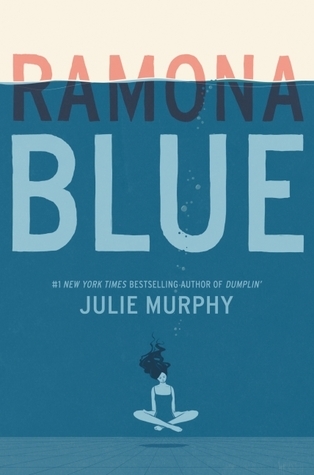 Overall, I really enjoyed Ramona Blue. It was a story about love and loss, new life and old friends, and sticking together to ride out some of the worst moments of a person's life. The characters were all intricate and hilarious and loving and perfect, in my opinion. Julie Murphy had me hooked until the very end and I can't wait to see the next book that she comes up with! So glad to hear you enjoyed this Jessica! I recently borrowed this from my library and am really pumped to dive into the book after hearing such fantastic things from everyone! Thank you so much for sharing and omg Freddie seems like the sweetest!